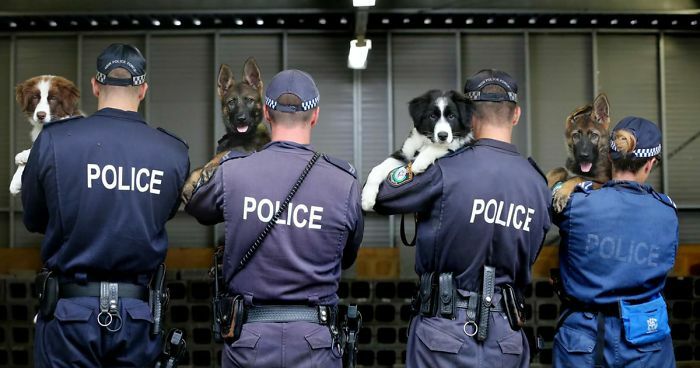 "Law enforcement" and "sense of humor" are five words that you don't often see together, but as you can see from this collection of Facebook posts recently shared by an Imgur user named MrTatems, Australia's New South Wales police force is so funny that they should be locked up for making us laugh so hard. Their official Facebook page is full of witty, sarcastic, and downright hilarious posts that you certainly wouldn't expect to find on a police profile, from dogs getting arrested for being drunk, to calculating the amount of money Australians have lost due to scams in packs of chicken nuggets. See below for some of our favorites, and don't forget to vote for the best. You'll never think about the police in the same way again. Sorry, you have to wait 48 hrs before we can do anything. cute pupper, here to melt your heart, you will turn yourself in. Monday is in your face! "So, can you bark?" - "Miao...er...Wiif Woof...er, yes, Sir." I'm heard of hearing, I swear you asked me the time, officer. Won't be the kind of force you want to be with you. I think you need bigger cups of coffee, than those two little ones. Won't get you through two hours of work, you will need to go back for more, to finish out shift. I think that is world wide. How can someone respond to that with an angry face on facebook?! LOL! This had me, last night! I was thinking "why isn't the damn picture loading?" who ever does their social media... their pun game is on point. How long before they be back driving without their Provisional Driver Licence. Wow! How in the heck were they able to drive with tyres like that? Ohh yeah, applies to nurses too. Let's go ask your Mother-in-law. That relationship will get you killed, I would break up with it if I were you. I swear officer I just picked it up, right this minute. You mean locking our legs together won't help keep us safe???? That's the same tire as the other picture. I swear it won't hurt.